Larisa Zehr (pictured), Jessica Sarriot and William C. Morris are recent EMU grads who have headed 2,000 miles south to work alongside Colombians seeking to emerge from decades of warfare and destitution. Photo by Emma Stahl-Wert. 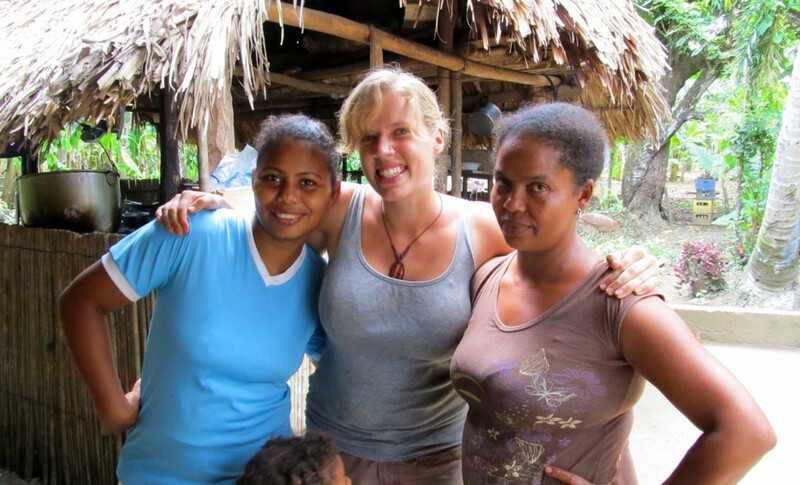 Months after earning their undergraduate degrees from Eastern Mennonite University (EMU) in 2011, Jessica Sarriot, Larisa Zehr and William C. Morris headed 2,000 miles south to work alongside Colombians seeking to emerge from decades of warfare and destitution. EMU’s three graduates joined seven others for two years of service in Colombia under the SEED program of Mennonite Central Committee (MCC). According to Witness for Peace – headed for the last 25 years by social worker Sharon Hostetler ’80 – Colombia has the largest refugee population in the world. “More than 5.2 million Colombians have been internally displaced by right-wing paramilitaries often working in conjunction with Colombia’s U.S. funded and trained military, left-wing insurgents, indiscriminate aerial fumigations, large-scale extractive industries and agro-fuel production,” says the Witness for Peace website. A variety of peace-and-justice groups, including Justapaz of the Colombian Mennonite churches, are helping with the recovery effort at the grassroots level. Hershberger, who has an oversight role with MCC, was in Colombia as part of an MCC study tour. In the spring of 2013, she and her husband Jim will be leading a couple of dozen EMU students to Colombia for an accredited cross-cultural experience. Zehr (pictured), Sarriot and Morris are recent EMU grads who are under the SEED program of Mennonite Central Committee (MCC) to work alongside Colombians seeking to emerge from decades of warfare and destitution. Photo provided by Larisa Zehr. The SEED participants in Colombia are expected to gain understanding of the economic, political, cultural, and religious factors feeding violence and poverty. Living among the general population, they work for peace, justice, equality, and livelihoods. Sarriot, a U.S. citizen who has lived on three continents, is based in Medellin, the country’s second largest city and birthplace of the drug cartels. A peacebuilding and development major, Sarriot works with the Sanctuary Peace Church Network of Antioquia, which is comprised of 12 evangelical churches and organizations. One of them is an Anabaptist/Mennonite congregation that supports a group of war victims through community-building and workshops on trauma healing. Sarriot is also running 12 workshops in a men’s prison under the auspices of the Prison Fellowship. Likely some of her students were members of paramilitaries, perhaps even soldiers who victimized those in need of trauma healing. Morris, a business administration major from Charlottesville, Va., is assigned to the city of El Carmen de Bolivar, where he works for a local church and a regional food cooperative. In both cases he is helping displaced farmers organize projects related to food security and general economic development, such as a newly opened farmers’ market. He is also leading youth Bible studies with a focus on life planning and career callings. Many of the farmers Morris works with were driven out of their farms in the surrounding mountains during the civil war. Morris is involved with community land purchasing for small farmers. Zehr, from Pittsburgh, works in the remote mountainous community of Berruguita, which got caught in the struggle for territory between paramilitaries and guerillas in 2000. Most of the residents fled the area but many of them have gradually returned. “My work is accompanying the community as they attempt to organize both to demand their rights as citizens and as victims of the armed conflict,” said Zehr, who (like Sarriot) majored in peacebuilding and development. As an example, Zehr cited their pursuit of improvements to the community’s rutted access road. Also, in the spirit of the government’s land-reform program, the community is fighting for their right to collective land ownership. Zehr also helps supervise a small-loan program for local farmers and helps supply produce to the farmers’ market that Morris helped launch. 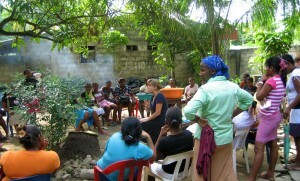 In addition, she works with a group of local mediators who are developing another way of dealing with conflict.